"... Venus power is the power of Art [Star] and the power of Magic [Monkey]. Art is the natural function of the power of accomplishment. The magic comes from the correct aligning of our will with the Divine Plan, because the Divine Plan consists of all the Laws of Nature. The Laws of Nature are not always what modern science says they are. They have much more to do with putting the mind in the correct place. […] "There is not a separation between Divine Law and Natural Law, so the Revelation of the Law of Time is actually a Divine Revelation of a natural law. That's why we say, "a Divine Plan for a Divine Planet." "John Martinaeu - The Dance of Venus (An accurate scientific drawing of Venus stunning pattern around the Earth. Our closest planetary neighbour draws a huge pentagram pattern around Earth every 8 years or 13 Venusian years. Four of the eight-year Venus cycles are shown, with the motion of Venus around Earth over 32 years), “A Little Book of Coincidence”, 2002." "If Venus and Sirius are the brightest stars in the sky and were used by our ancestors as the most reliable celestial markers to determine the start and end of larger cycles of TIME, why so few people today seem to know so little about these ancient time-markers and why the importance of these stars has been hidden/minimized to Humanity? On this second pART we will start to pierce the veil of Time and unveil the mystery behind Planet Venus and Her significance and influence since our most ancient past to our most present day. As mentioned on pART 1, we also recommend now to let go of your preconceived ideas around time and allow the new information presented here to surprise you and invite you to think in new ways, including exploring the fabric of TIME-Space in a whole new way. "My take on Sacred Time is not complicated by hopes for ultimate solutions or fears of "end time" catastrophes, or the generic good/bad predictive concerns of daily astrological magazine columns. "Sacred Geometry" is used in architecture to assist in the creation of designs and spaces with an uplifting, harmonious feel and transcendent resonances, something I regard as a tangible benefit on both a personal and a societal level. Why limit this to the three dimensions of space? 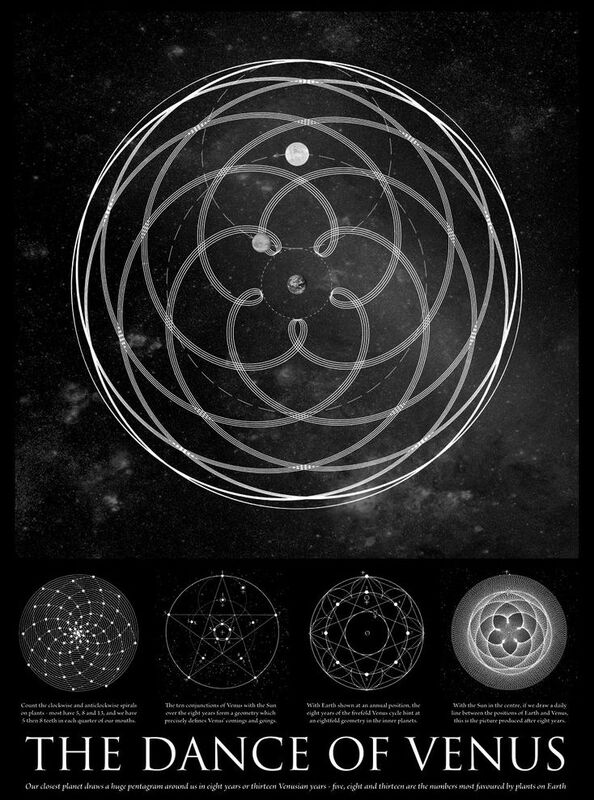 A sacred calendar, as I see it, will potentially be a way of using sacred geometry to apply this same alchemy to time. Though there may also be metaphysical effects subtle and manifold, the basic aim is simple: to create harmonious, uplifting ways to think about time. Thus, working with and marking out time becomes comparable to entering the precincts of a beautiful temple complex. Put another way, a sacred calendar is a kind of holo-morphic time field. "Holo-" like a hologram, since the parts are joined up to the whole of a bigger pattern by geometric relationship, reminding us of a conception of time more sophisticated and inter-connective than the straight-line model, and "-morphic" to recall the theory of morphic fields, of forms resonant through a transpersonal ether. Town planning with an eye on the beautiful can have a massively uplifting effect on a community…so what about an art of time planning? Linear calendars are practical at the mundane level, but exclusive focus on the mundane leads to boredom. It is characteristic of Sacred Time that it is marked for more than purely mundane purposes. It transforms zones of space-time into things of beauty, having about them an elegance and sense of proportion and interrelationship. Sacred geometric calendars do for time what yoga does for the body. The opposite of boredom is creative force, known as Kundalini or Serpent Fire in the Hindu traditions. A more interesting conception of time (than the purely mundane) facilitates rather than hinders this force. Enter the Serpent as totemic day counter, the good serpent whose apple teaches the way back into Eden. Stripping away notions of "end times" or utopias bestowed on us for no reason other than that somehow "The Time Has Come" does not have to mean an exclusion of the beauty and juiciness of mythic influxes. We have a tradition of architecture that we term classical, and an intrinsic part of what we understand by that word pertains to a style that invokes the mythos of a Golden Age, a time that exists eternally as an idea. Sacred Time, similarly, is a way of bridging this idea – the Golden Age – to time as we experience it. If you want the following to come alive, don't read it merely as dry facts and figures, but probe into the patterns with the opened eye of the mind as if travelling beautiful time tunnels to heavenly inner spaces, and as the days of the calendars unfold allow yourself to remember an identity as a player – a beautiful hero or heroine even – on a Golden Age scene – privately, humbly, subtly, non-quixotically. 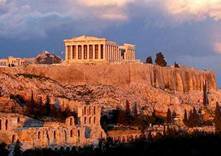 Classical temples were adorned with stories sculpted onto their pediments; the best mythologies with which to adorn the calendar of Sacred Time are surely those that are to do with beauty, the manifesting of the Golden Age, and the evolution and greater fulfilment of human potential." The 260-day Tzolkin/ Harmonic Module is comprised of 5 castles of 52 days each (5x52=260). As we navigate this 13-day Venusian Wavespell of MAGIC (that started 7 days ago at the Core/Heart of the 13:20 Harmonic Matrix of Time -Tzolkin), we have been noticing the intensity and accelaration of our journey through the galactic "birth canal: the 7th Central/Mystic Rainbow column of the "mirror-less" dimension home of the Galactic Maya. It was right during this same time passage at the heart of the Tzolkin and at the central core of 4th of the 7 Years of Prophecy (1993-2000) that Dr. Jose Arguelles experienced a profound 28-day Initiation/Re-Birth process that culminated with a new self-identity and the retrieval and decoding of a vast amount of key complimentary information connecting this new system of time with our original evolutionary blueprint : The Human DNA code. 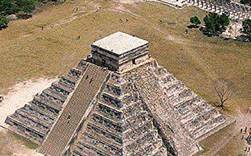 The initiation concluded on KIN 132 ~ Yellow Lunar Human: one of the clear signs upon the Tomb lid of Pacal Votan, signifying "the prophecy of the Lunar Human of Non Ego who has returned to harmony with the cycles of time through the 13 Moon/28-day calendar (13 x 28 =364)"
"Besides the Himalayas, a powerful concept influencing Roerich’s paintings relates to the idea of ‘The Mother of the World’ [...] ‘The New Epoch,’ said Helena [Roerich], ‘must manifest due respect to the Mother of the World, to the Feminine element. “The bird of the spirit of Humanity cannot fly with only one wing” – these are the words of Vivekananda, who meant to affirm the great significance of the Feminine Principle... The star of the Mother of the World is the planet Venus. In 1924 this planet for a short time came unusually near, pouring its rays on Earth and creating new powerful and sacred combinations to yield great results. Feminine movements were kindled by these powerful rays." "Many regard the World Mother as an exalted office in the Hierarchy, functioning at the planetary and cosmic levels and held in the past by a number of entities, such as the Egyptian goddess Isis. Thus The Mother is one of many archetypes through which the Divine Feminine has manifested, and she is described as expressing beauty, tenderness, grace, sacrifice, purity and joy. She is also involved in service to humanity and the natural world through her nurturing qualities, always inspiring people to undertake world service. 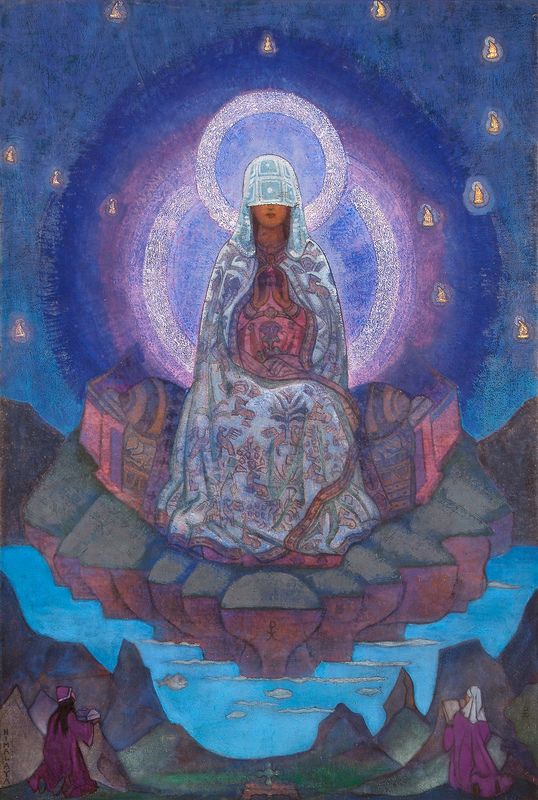 Greater awareness of the Divine Feminine emerged with the appearance of H.P. Blavatsky, Mary Baker Eddy, Helena Roerich, Dion Fortune and Alice Ann Bailey – those at the forefront of the esoteric teachings. 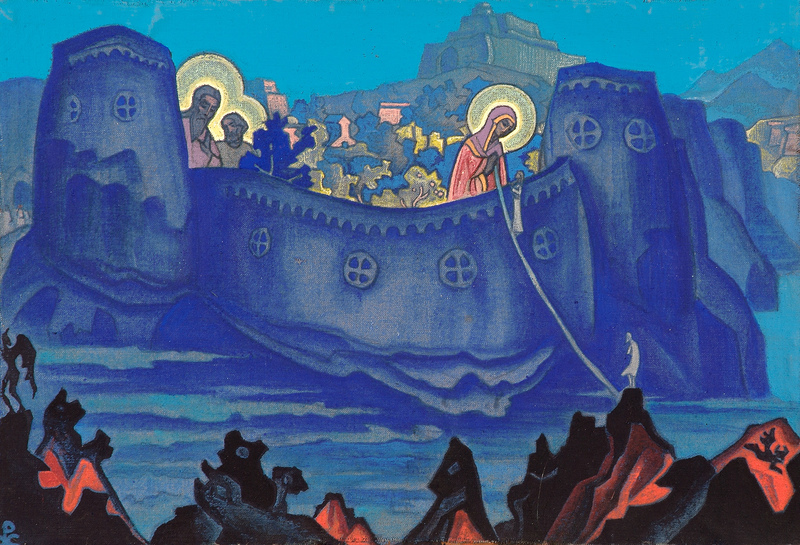 Helena Roerich in particular was influenced in her early years by the reverential tradition of Sophia, the expression of Divine Wisdom in the Russian Orthodox Church." "In the painting she is veiled, to conceal the mysteries as yet unrevealed to humanity, but now is the time for it to be lifted and for her to participate in human affairs this century. 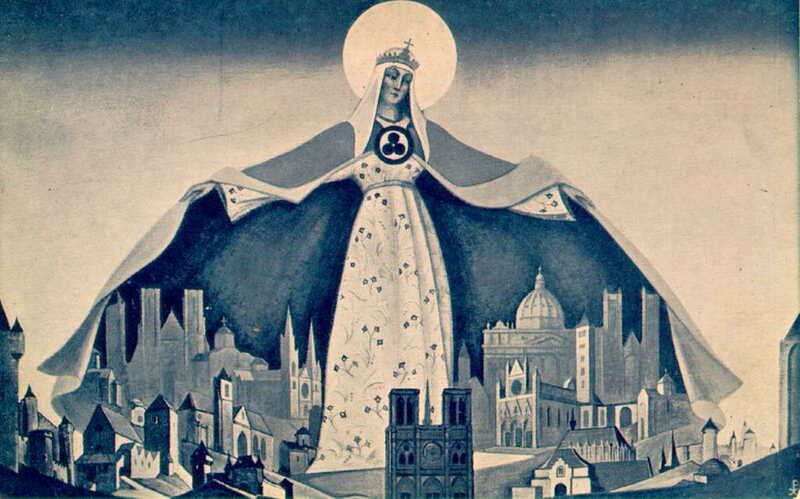 In 1928 Annie Besant declared March 24th (the Feast of the Annunciation) to be World Mother Day, whilst Geoffrey Hodson described her as an archangel, the embodiment on earth of the Feminine Aspect of the Deity and an Adept in the Inner Government of the World... womanhood and motherhood in their fullest perfection, whilst undertaking the role of the birth of Christ consciousness and a new World Order of environmental and social harmony. Now there are almost 80,000 Internet websites devoted to her." "The ancients always began observing the Venus/Inanna cycle after her conjunction with the sun when she was first visible (10 degrees distant from the sun) in the eastern morning sky. This is called the heliacal rising of Venus and corresponds to her interior conjunction with the sun when she is closest to the earth, brightest, and retrograde. She then spends approximately 260 days, or 7 lunar cycles in the east before descending beneath the horizon for approximately 60 days where she forms an exterior conjunction with the sun. This 60-day period when Venus is too close to the sun to be observed is likened to her being in the underworld. She then rises in the west for another approximate 260 days or 7 lunar cycles before returning to the underworld for a short 0-20 days." On August 21,(KIN 140 10 Sun) on the last day of the Tzolkin Mystic Column/birth canal, Venus is being re-born in the Morning Sky as a whole new Archetype of the Feminine. This re-Birth phenomena signals the start of a new (Shamanic) Synodic Cycle of 584-Days and is therefore a great opportunity to set renewed intentions to reconnect ceremonially with Her Light Frequency. The PsiChrono unit / memory cell active on the PSI Bank for this day is KIN 260 ~ Yellow Cosmic (13) Sun (20): the embodiment of the 13:20 Organic/Natural Time frequency. Bear in mind that it was exactly 260 days (1 galactic spin) ago, on December 4, 2014 (KIN 140 10Sun), when Venus was "re-born" as the Evening Star. or click below to donate, your contributions will help establish a Galactic Culture based on LOVE, PEACE, ART & SYNCHRONICITY on Earth.